The Queen’s children were so upset by their absence on the balcony beside the monarch during the Diamond Jubilee celebrations that they’re attacking Kate Middleton’s hierarchy in the royal family. That’s the real reason for the new curtsy rules, says Daily Mail writer Richard Kay. Kay explains that Princes Andrew and Edward and Princess Anne were hurt when the Queen only allowed her heir, Prince Charles, and his family including Princes Harry and William and Kate Middleton, up on the Buckingham balcony. At the time, the media speculated the Queen was sending a message that those few alongside her – including common Kate – were the future on the monarchy. 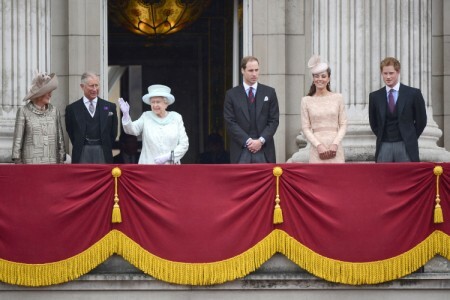 Everyone joined the Queen during her balcony appearance ten years ago for her Golden Jubilee celebration. So what changed? Kay says sources think it had a lot to do with Prince Phillip’s absence. He was in the hospital during this family photo op and Kay thinks “key courtiers” whispered the idea to the Queen. Others suggest it’s all in the plans to “slim down” the monarchy. Prince Charles has said he’s in great favor of just senior royals carrying out official events. It would cut the royal family budget and assuage critics. This new proposal has angered Andrew since his daughters, Princesses Beatrice and Eugenie have wanted to not really work for a living and take a more active role as royals. I think their outfits to Kate’s wedding officially ruined that opportunity. According to The Telegraph, there are currently 16 full-time working members of the royal family but Charles wants to cut that number to eight or nine when he becomes king, leaving no room for the likes of Beatrice and Eugenie, or their younger cousins, Edward’s kids, Viscount Severn and Lady Louise Mountbatten-Windsor, when they come of age. They need to get JOBS. Andrew lobbied for his daughters to help him out on royal engagements but he was told no. Kay asserts that Harry will be phased out more once William and Kate have children, but I doubt he cares. Harry knows he can grab more asses and have more fun when no one’s watching. But the senior royals got even. Now Kate has to curtsy to them if William’s not around. Kate pretty much has to curtsy to everyone when William’s not around. Is that fair? I don’t think so. I get that they feel snubbed, but Kate is the future of the monarchy. Like it or not, Kate’s baby will be in charge and she will be Queen. That’s why I never understood why people continued to talk sh-t about Kate after she got the ring. She’s going to be QUEEN! Do you think she doesn’t have a memory? If I was Kate, I would smile sweetly and keep a running tally of all the people who forced me to curtsy to them – especially if Beatrice and Eugenie made her do it in silly, casual circumstances. Then I’d make them pay! But I’m shallow and petty like that, maybe Kate isn’t. I always thought Kate got along well with Andrew’s girls but maybe the balcony snub was enough to bring out their inner evil step-sisters. Do you think the senior royals have a reason to feel salty to the upstart Kate or should they move on and get lives outside of the royal family?